When you think of fishing in coastal Georgia, the two species that most often come to mind are spotted seatrout and red drum. 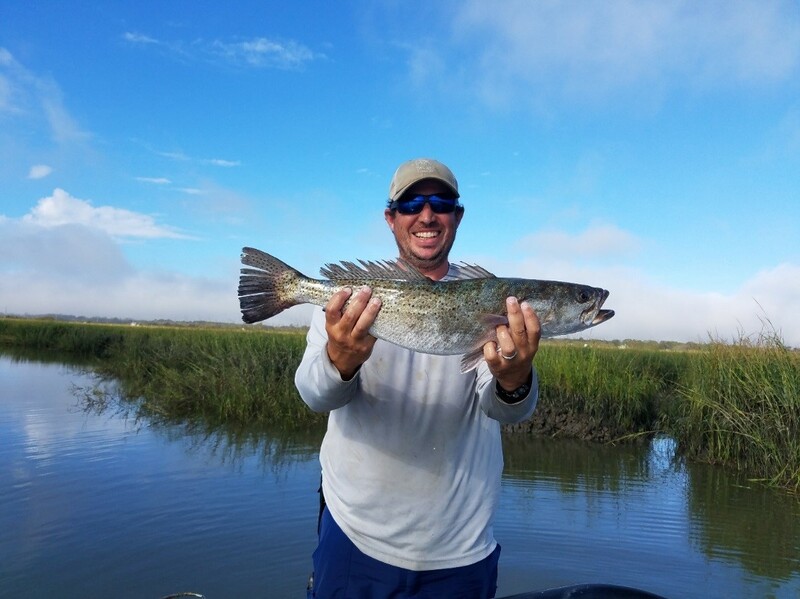 Locals and tourists alike flock to the sounds, abundant marshes, meandering tidal creeks, and coastal rivers to try and “hook up” with one or both of these species. Understanding the importance of the two most targeted fish along Georgia’s coast, CRD staff began the Marine Sportfish Population Health Survey (MSPHS) in 2003 to collect timely and relevant data on the abundance and habitat preferences of these fish as well as other recreationally valuable inshore/nearshore fish species. This survey allows biologists to monitor trends in sportfish populations over time. All fish collected in this survey are identified, measured, and released. Red drum are targeted using gill nets during the summer months. These single panel nets are pretty size specific and most often capture fish around the gills (shown below). Although red drum have been known to reach lengths of nearly 5 feet, we are most interested in those fish between 9 and 13 inches. These are the fish that were spawned the previous fall. Sampling in 2017 showed a strong year class of red drum. In fact, 2017 turned out to be one of the best recruitments since 2010. Biologists caught 600 individuals in 216 gill net sets. Figure 1. 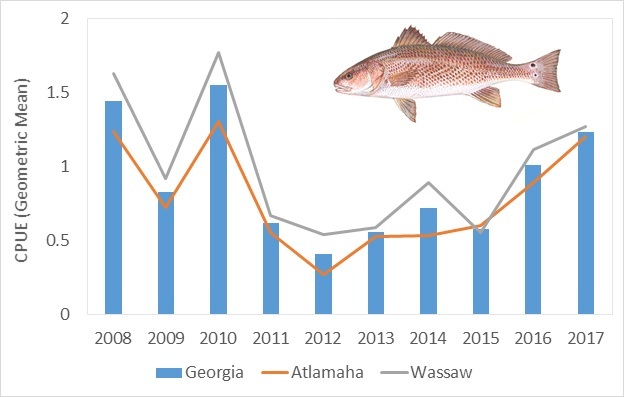 Red Drum catch per unit of effort (CPUE) in Georgia. This is the number of red drum (catch) per net (unit of effort). Geometric mean is used to help compensate wide variability of catches. Spotted seatrout are targeted in the fall months using a modified 3-panel gill net called a trammel net. This net is less size selective than the single panel net used for red drum and allows multiple species of different sizes to be captured. While some fish are effectively “gilled”, larger fish are “bagged” (shown below). Most spotted seatrout captured in this survey are mature fish. 2017 was also a productive year for spotted seatrout with 322 individuals captured in 150 trammel net sets, September through November. Figure 2. 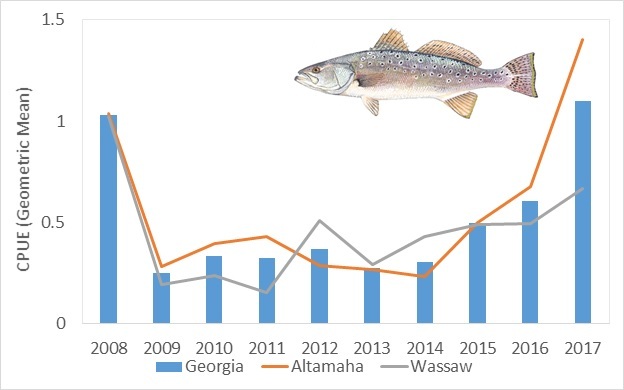 Spotted seatrout catch per unit of effort (CPUE) in Georgia. This is the number of spotted seatrout (catch) per net (unit of effort). Geometric mean is used to help compensate wide variability of catches. Currently, the MSPHS only samples the Altamaha estuary and Wassaw sound. CRD staff are in the early phases of adding St. Andrew sound to the survey. This sound system would help provide an additional data source on the abundance of red drum and spotted seatrout in the southern region of the state. Biologists and technicians hope to begin fully sampling the new system by June 2019. This addition to the MSPHS is made possible from funds from the 2017 Enhanced Fishing License Revenue bill passed by the Georgia Legislature. 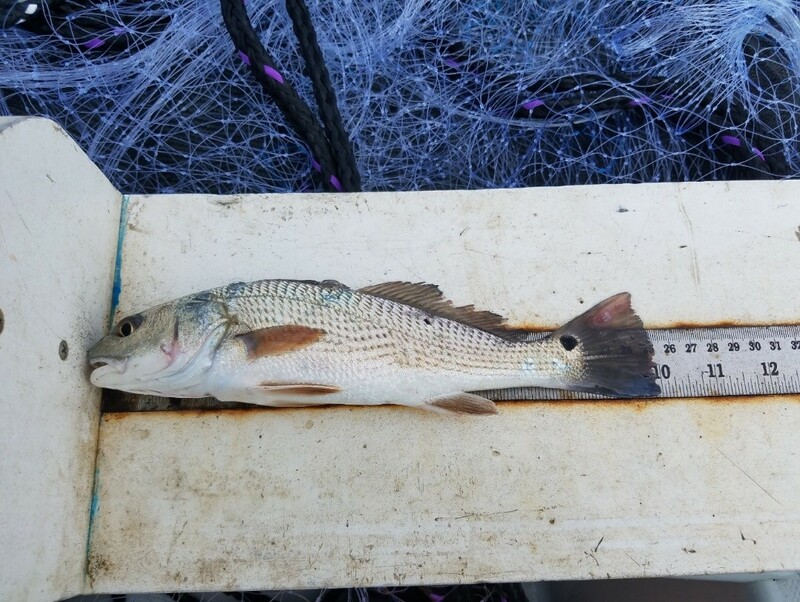 A 10-inch red drum captured in the summer gill net survey. In some parts of their range these fish can reach nearly 5 feet in length and weight more than 90 lbs! Marine fisheries technician Michael Mock holding a large spotted seatrout captured in Village Creek using a trammel net.